With the release of the Large Prairies being imminent we thought it would be good to sum up the features and everything that comes with the DLC. ALL members of EVERY class listed for each era are included with appropriate components and shed codes, which can also be selected by you by editing the scenario loco number. 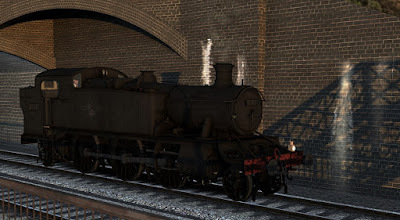 We covered the new advanced braking system in this post, developed with the help of two GWR preservation drivers, it adds a whole new realistic element to driving our steam engines. The pack should be released very soon and as always we look forward to seeing these engines on people's routes mixed in with all the other excellent GWR engines that are available in Train Simulator. Coming soon... work starts on the LNER Q6! BUY! BUY! BUY! BUY! BUY! BUY! BUY! BUY! BUY! BUY! BUY! BUY! BUY! BUY! BUY! BUY! BUY! BUY! BUY! BUY! BUY! BUY! Feedback is always useful. Can we ask what you don't like about it? That is true in real life as the water moves in the boiler, however in game it is impossible to replicate that behaviour and it won't happen. What we can do is replicate the motion of the water level moving up and down in the glass with the acceleration, gradient and regulator opening, however even if the glass reports "empty" due to this movement the game still won't end because the real water level for the game is static and can't be changed up and down other than using it up by driving or by filling it with the injectors. You can run out of water of course, but only by thinking you have more in the boiler than you really do due to it reporting higher but that's a skill that a real fireman has and can be learned in TS as well. But we found it very poor in the game that you could read the "normal" gauge glass and see EXACTLY how much water you have to the gallon - that is totally unrealistic. If you ever have the pleasure of driving a real steam loco you'll find that it is not exact in any way and just being aware that the glass is 1/4, 1/2 or 3/4 full is quite sufficient anyway. It's another skill to learn, knowing your engine and knowing when on a gradient, accelerating or braking, and having the regulator open that you know how much that effects the water level in the boiler. It's no different to managing the steam production (with the dampers, blower, etc) or the steam chest with the regulator. All part of the skill of driving a real steam engine. Not as part of this pack. We may do a reskin pack if enough people are interested. no 3100 or 3150 class? thats kinda sad. but oh well. good work! The 3150 used a much larger boiler and would have required a large remodelling which would have pushed the pack price up or had us leave out a livery. Oh extremely good value, but if a 3150 was made in a vein similar to your 7200 pack, i'd gladly open my wallet for some more.